The Xihai Grand Canyon (West Sea Grand Canyon), also commonly referred to as the Magic Scenic Area, is one of the most beautiful sites on Huangshan Mountain. Recently hiking trips through this canyon has becoming extremely popular. Scenery keeps changing as you walk on steep steps usually clinging to precipices. Every step reveals a breath-taking view so you can just point your camera and take a perfect photo almost everywhere on the way. This image belongs to the travel and nature stock photo library. This stock photo of Xihai (West Sea) Canyon Scenery is available for licensing for commercial and editorial uses including websites, blogs, books, magazines, brochures and advertising. Restrictions may apply for images which contain third party copyrighted material or sensitive subjects. Photos of artwork are for editorial use only. 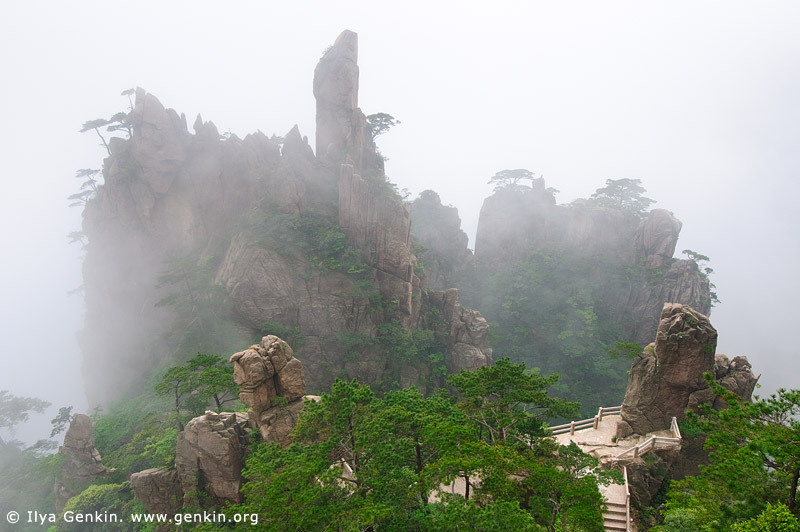 This image id CHINA-HUANGSHAN-0011 of Xihai (West Sea) Canyon Scenery, is copyrighted © by Ilya Genkin. This is not a public domain image.